Leaked Christmas 2013 plushies! | Angel's Rilakkuma Blog! Look what Kuma Doki Doki found! This entry was posted in Uncategorized and tagged Christmas, Japan, kawaii, kiiroitori, korilakkuma, leaked, news, plushie, rilakkuma, san-x, Santa, stuffed animal, Tokyo by Angel. Bookmark the permalink. I want reindeer! !! Maybe its too close to some of their recent /coming soon themes, but a gingerbread house or CandyCaneCity and some reindeer in a playset…just take all my money now, San-X!! Did you get last years Christmas ones? I know that would be so cool!! Now I want it to be December!! HAHA! This is so hilariously cute! Damn you San-X!!!! 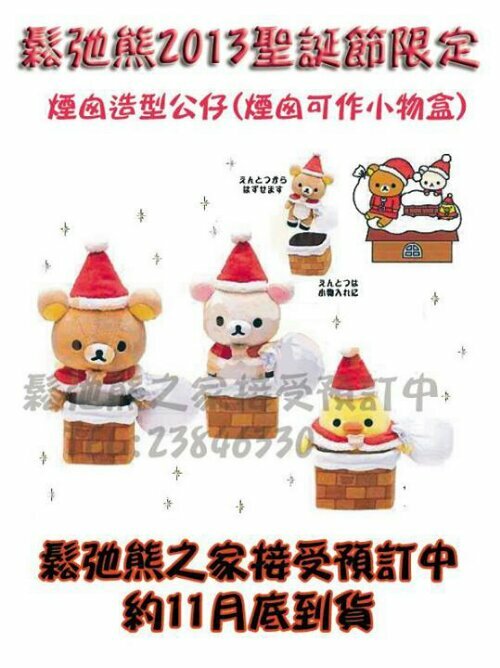 Pingback: Leaked Christmas 2013 plushies! | Everyday with Rilakkuma feels happy like a Rainbow! They are stuck in chimneys!!!! !